I love junk and cute jeweleries. And the cute ones are easy to make all by your self. So, I thought why not make some with buttons and since I am into finger rings off late, I came up with this. 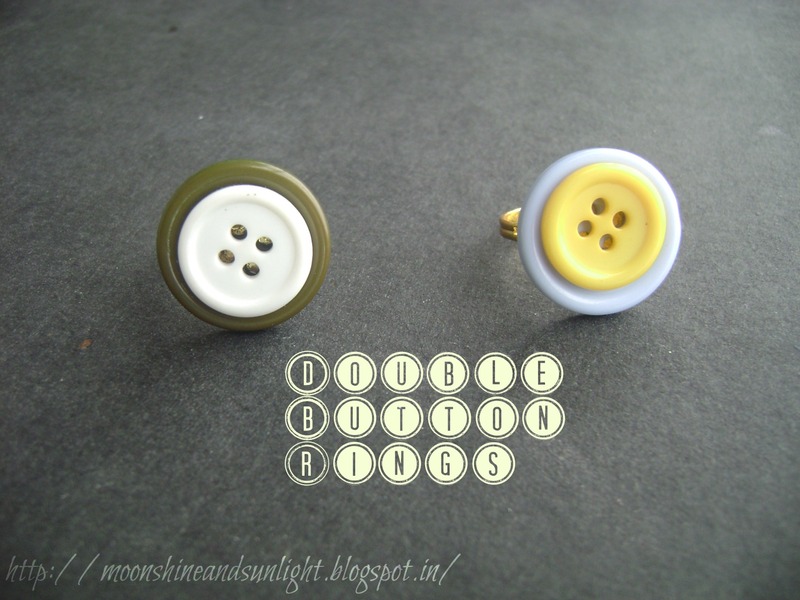 Read on to know how to make these simple rings ! 2.Apply glue on the rear side of the smaller button or on the top of the bigger one. 3.Stick both the buttons first. 4.Apply glue on the base or at the rear side of the bigger button. 5. Press the ring and the button. It basically takes two minutes for making these super cute rings. I did it sitting in my verandah on a very lovely day with a lovely weather. I hope you enjoy yourselves as much as I did. wow thats nice but where to find ring base?? Yup nice and easy ! talented you are :) awesome !! Thank you sooo much !!! love this... simple but oh so cute!!! i just have to give this a go!! yup these are really really cute ! !